Last night we had an early dinner (4 p.m.) at the Stables Ranch Grille, one of several restaurants at the Tuban Golf Resort and Spa. Mark and I have driven past the Resorts hundreds of times on our way to Nogales or Tubac. For many 4th of July evenings, my mom, who lived with my dad for 24 years in Green Valley, wanted to go to their open-to-the-public fireworks but dad didn't want to make the drive and deal with the traffic. What a jewel this place is! 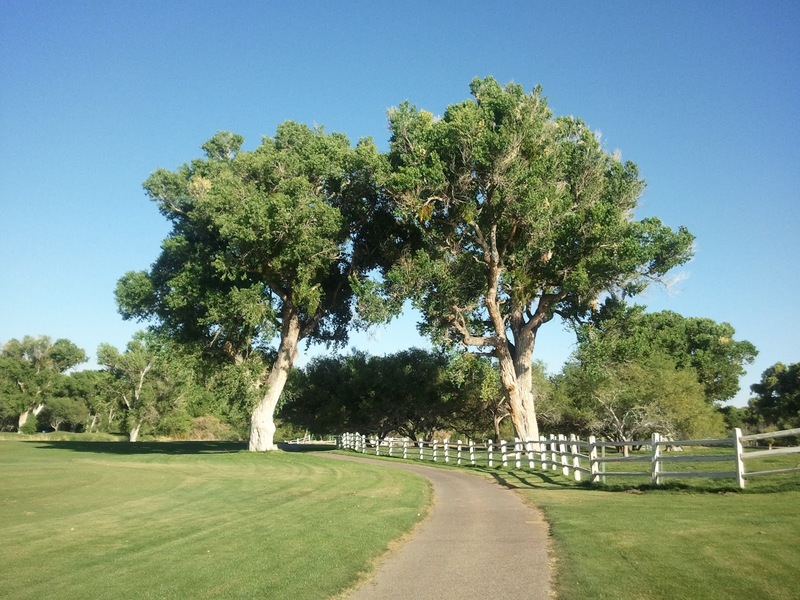 We were so surprised by the spacious grounds (27 holes of golf), housing and resort buildings. The brochure we picked up in the lobby describes the site, a 900 acre ranch owned by the Otero family, as the oldest (1789) Spanish Land Grant in the Southwest. We asked to be seated on the shaded patio at the Stables and looked out on the greens, on the newly unfolded leafy cottonwoods that have grown along the Santa Cruz River and even a few cattle grazing--in keeping of the original ranch spirit of the place. Our server, Marta, reminded me of the "old school" of servers--personable and professional. Our meal, prepared by Chef John L. Wooters and his staff, was wonderful. We put in a split order for Ceasar Salad (without anchovies), rib eye steak in port glaze, mashed potatoes, broccolini and Mexican Key Lime pie for dessert. We were not charged for the split order and my husband also had a cup of chicken and bacon chowder which he said was "smokey and divine." I am fussy about my salad and I appreciated the small pieces of romaine and fresh cheese, accompanied by warmed multi-grain and crunchy white bread and butter served at room temperature; thus we didn't have to put chunks of it on our bread or tear up the bread because the butter was too hard--a particular peeve of mine at even some upscale restaurants. 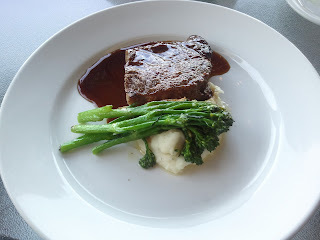 Our steak was grilled to perfection--juicy and tasty with the pungent glaze and the cut had very little fat. Potatoes were creamy and, even in a split portion, were more than enough along with the crunchy and delicate broccolini. The dessert was perfect for cooling off our palate and just right balance between tart and sweet in the lime flavor. After the sumptious dinner, Chef Wooters came out to greet us which is always a nice touch for foodies such as we have become. 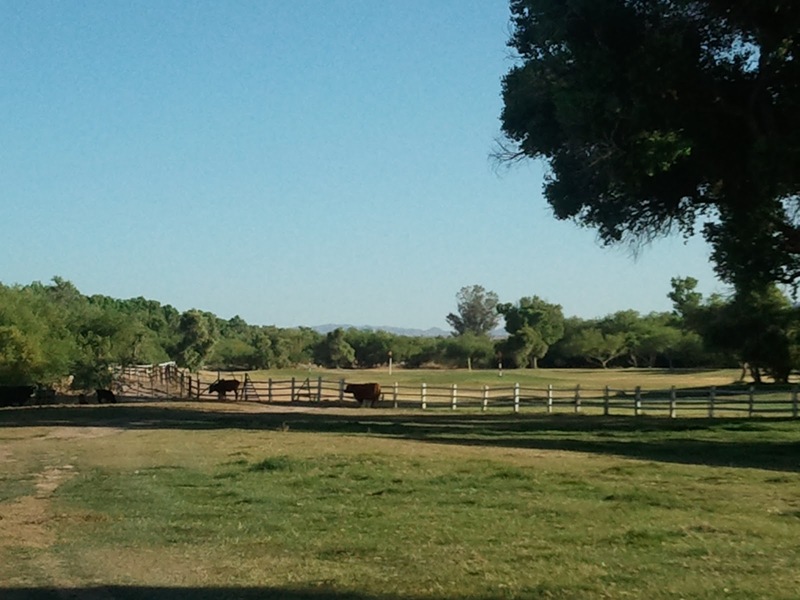 We had time to take a walk along one of the golf cart paths and came close to the cattle and trees along the river. It was so quiet as the almost-full moon began to rise in the Santa Ritas. We heard the leaves rustle, the sound of the train from Mexico, dusk-dwelling birds trilled and, somehow, I was reminded of the solace I experience at my grandparent's farm in Illinois. Rural is rural, wherever you are, I suppose. We will return--maybe for the 4th of July Celebration--but certainly, for another meal at the Stables. Is there a place you are reminded of when you see this pictures? 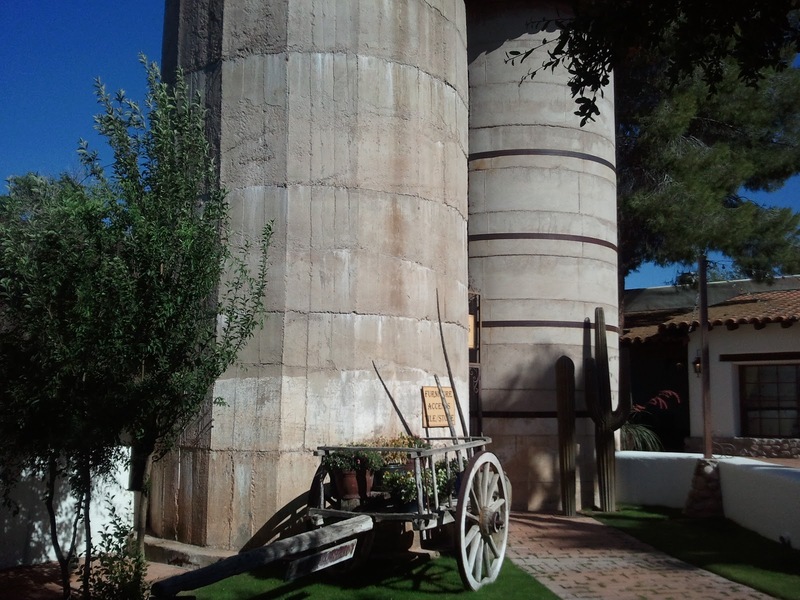 Original ranch silos with vintage cart. Can you see the cattle along the white picket fence? Two calves are in the shadows to the left. Even a split portion of our entree makes a pretty picture and enough food for each of us. 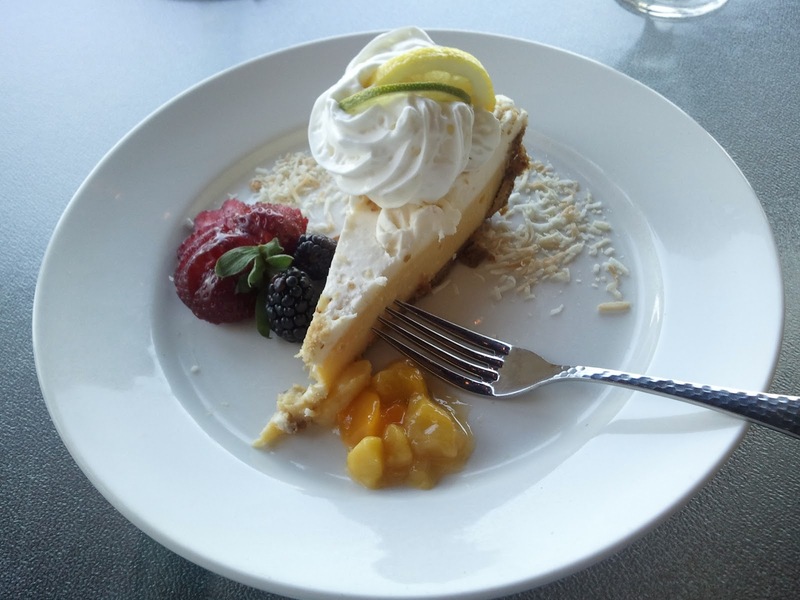 The Mexican Key Lime pie was dusted with toasted coconut and served with fresh berries and mango relish. All so yummy in texture, taste and color. Penca Restaurant a potential "brightspot"